From the raised panel sides and door fronts, to the beveled drawers and flowing foot design, this elegant Wrap Around Armoire has all the beautiful details of an early American antique, with the modern luxuries you need in for your bedroom suite. Add the extra storage you need for your wardrobe, without sacrificing style and functionality. 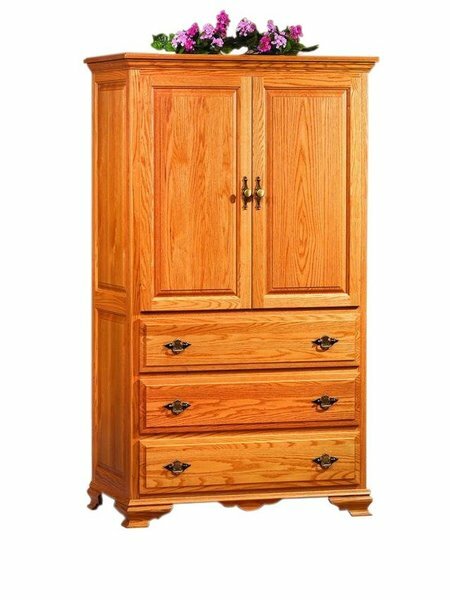 Crafted from solid hardwood, this armoire features two doors that are perfect for storing folding and hanging clothes, as an extension to your dresser and closet. You can also customize this section by adding pocket doors, a pull out TV swivel and DVD/cable box stand that will transform your decor to include an entertainment center, so you can catch your favorite shows before you go to sleep. 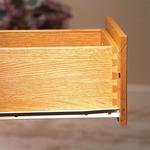 When closed, this also helps to maintain a classic, tidy appears for your bedroom suite. Below lies two drawers (three drawers available with the 70" option as shown) - each with a dovetailed drawer box that is mounted to full-extension glides that pull completely away from the frame, giving you access to all of your items inside quickly and easily. Easy to include into any decor, this armoire can be customized with your choice of nine different hardwoods and finished with an array of different stain options, giving you the freedom to place this armoire into any bedroom in your home. 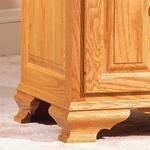 Choose your favorite hardware to finish up the piece and your new armoire will be bench built just for you. Call one of our Amish Furniture Specialists today to request stain samples, start your order by phone, or request a custom quote for any changes to this armoire.